While they were on tour with The Academy Is… and We The Kings, I caught up with power-pop rockers Hey Monday for a quick photo shoot. Fresh off the “Bill and Trav's Bogus Journey Tour,” Hey Monday are blowing up arenas across the US with Fall Out Boy, Cobra Starship, All Time Low, and Metros Station. 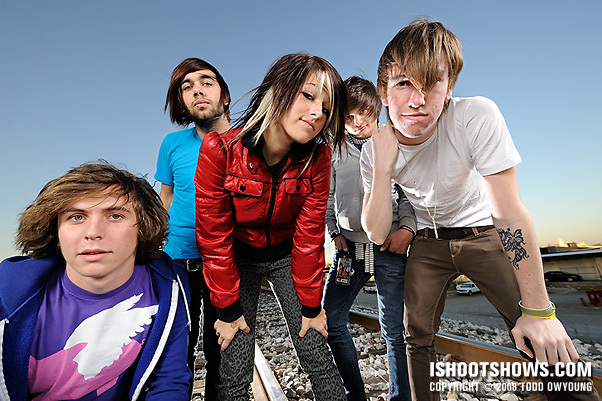 First off, I just have to say how much fun it was to work with Hey Monday. This group was so down to earth and easy to work with, I was a fan even before seeing them rip up the stage. We were fighting some pretty strong wind during the end of the quick shoot, but the whole gang were troopers; just a pleasure to work with. I used the Nikon D3 and the Nikon 14-24mm f/2.8 and Nikon 24-70mm f/2.8. For lighting, I used the Nikon SB-900 in commander mode to control a set of three SB-600s acting as wireless remotes. While the shoot time was based on the band's availability, we lucked out with a great slot just as the sun was setting, which allowed for some nice contrast between flash and ambient lighting. 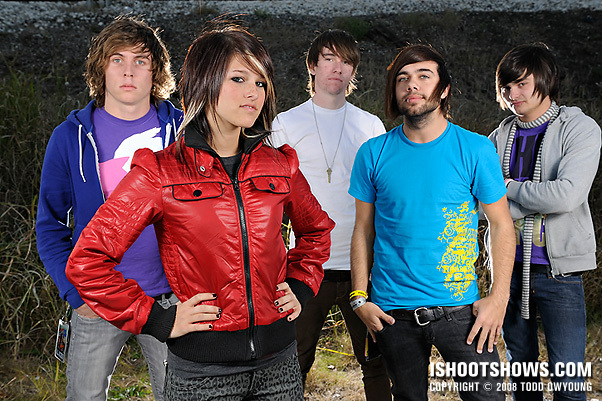 I'm pulling for Hey Monday, and I'm excited to see that they're sharing stage with some great bands on their Spring tour. 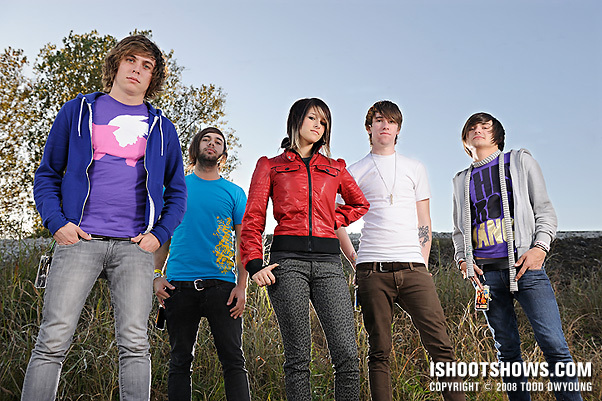 Cassadee, Elliot,Mike, Jersey, Bobby, and Alex: Good luck! Love the composition on that last one, Todd. That’s a heckuva shot. Hey Jason, thanks for the feedback. That last shot you mention was one of the last group shots before we broke for quick individuals. Nothing says tour like AAA. Great portrait work Todd. The lighting helps them pop nicely. Good stuff. Hey Craig, thanks for your input on this set, I appreciate it. I shoot the 24-70 F2.8 as my primary lens. I notice the stretching at the edges in the picture at the top of the page. I get that, too at 24mm. I’m curious. Does a prime lens at the same focal length do the same stretching or is that a specific error of that lens? The only two prime’s I have is a 50mm f1.8 and an old Sigma 105mm F2.8 macro. So, I don’t have anything that wide to compare to. I love this lens, but that’s the only thing that bothers me about it and it’s only around 24mm. It doesn’t always bother me, but if I get a face or body over on the edge, it starts to get that “cardboard standup” look to it. The first image was shot with the Nikon 14-24mm f/2.8, while all the rest were made with the Nikon 24-70mm (with the exception of maybe the last one, I’ll have to check). I’m not sure of the exact focal length, but it was pretty wide. 24mm on full-frame is wide, but wouldn’t have created the same perspective distortion. The distortion is a product of the focal length more so than anything related to zoom vs prime. Hey Jessie, thanks for the comment. It’s funny you mention We The Kings, because I was just looking for those. I thought I’d already posted them, but apparently not! I will post those next week or so, thanks for the reminder. hi todd, just wondering if you used any light modifiers on the flashes? thanks. love your site! 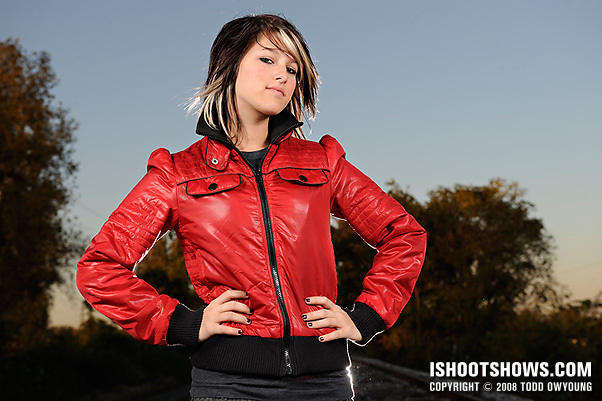 Hi Art, I used two 45″ reflective umbrellas for this shoot. Third flash was shot bare. Thanks!